This entry was posted in Cancer, Living intentionally, Scenes from my life, Spirituality and tagged acceptance, death and dying, examined life, metastatic breast cancer by Knot Telling. Bookmark the permalink. 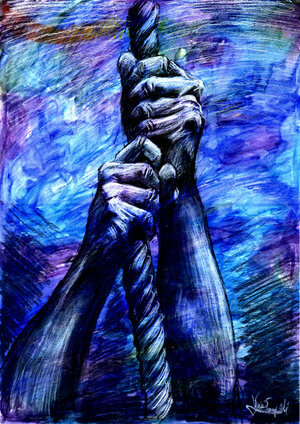 the comment area always asks me what do you think?………..Dear Knots, i think you have more courage then most anyone i know. If i could fly over to where you are and just let you cry (if needed) in my arms as i hold you i would……. NO Steve , not today, not this way……………and you are so much more in touch with yours then i……. what is in store for anyone isn’t ours to know, thank you HIGHER POWER. You might outlive your own expectations cause your God will do what he or she wants anyways. Kiss on the cheek from Texas. I believe all we can do is enjoy life. Spend time with friends and family. Accomplish some goals. be kind and share love with the important person. Life and death are a mystery. We are never ready to leave the good people behind. I hope you are feeling strong and live another 40 years. Dying consciously is hard. Period. I have recently dealt with sudden deaths and not-so-sudden deaths in my family, as you know. For the person who died I honestly think the sudden death must be easier. Awareness of a failing body carries all the frustration of childhood in reverse, because tomorrow you may be able to do less than today instead of more. What you are doing is very, very tough. Please don’t forget that. You have every right to cry, throw tantrums, hide, give up, bargain and accept again as many times as you need. If somebody took on running a triathlon we would admire their courage and determination. I think we should have even more admiration for someone who looks this stage of life in the face and tries to take it on consciously. If you need to distract yourself from time with busy-ness, I don’t think there’s anything wrong with that. That’s human, too. Athletes need to have breaks from training. So do you. Sometimes the mind needs a vacation from reality so that it come back at it fresh. Good thoughts and prayers from California. We have so much to learn from you, brave and sage woman. Prayers and love headed out your way. I can’t see how knowingly dying is ever easy. We like it too well right here on this earth and we do not know what lies beyond, however much we may have fought for faith. Do you know the book, The Next Place, by Warren Hanson? I read it at my son-in-law’s funeral and want it read at mine. But that doesn’t mean that I don’t want to stay here for a looonnnng time. I keep you in my thoughts and hope, when it comes, that your journey is safe and peaceful. I am so sad for you. When my sister died suddenly I was struck at how unfair it is that she (and we) had no opportunity to say goodbye. Reading your words I am struck at how unfair it is to live whatever remaining time you have left with this “knowing” impacting everything you do and every emotion. I know you will find joy on your birthday. I hope you find peace, as well. It must be hard knowing your fate. Since you are not ready, then thankfully you are still alive and I hope you can enjoy your days. I thank you for your honesty and I hope that we find a cure soon so no one has to go through what you are going through. All I can do is send you prayers of light and love and wish you well. You don’t want to die? Then don’t. **Let go** of death. Live today, laugh today, write today. Tomorrow’s dawn will bring yet another chance to let go of death. Sorry about that; I meant to quote Laura N and then add my comments. I am very sorry for you, Knot. I don’t know what you are going through. I do know about wanting to be in control, though. A certain group of people are notorious for this trait. Many say, “Let go, and let God”. As an athiest, “Let go” is sufficient for me. I hope it will be sufficient when I really need it. I send you an ENORMOUS hug. To loose control is not easy – to loose control of ones circumstances and functions is even more difficult when control is a form of security, and your grief at this loss is palpable. To abandon ones self totally to God takes courage, and I am sure you have that courage, and that God will bring you the comfort you need at this time, and the security of knowing your times are in His hands. I trust this does not sound like a platitude, as I can ‘hear’ your grief and fear and dislike of your current ‘place’ on this journey called life. I too am used to being in control, although that isn’t exactly what you said. For me this loss of control is the hardest part by far. Most of my life, if I wasn’t in control, I deluded myself into believing that I was. The delusions are becoming harder to sustain. Sending you prayers and good thoughts. It is hard to sustain our delusions. Unfortunately, we can’t unknow what we know. I’ve been thinking a lot about this post since I read it yesterday and I still don’t really know what to say other than I’m sorry for the anguish and for all the uncertainty (among other things!) breast cancer has brought into your life. Your words are very powerful. Your feelings even more so. I admire you for sharing them with us. I hope knowing your words are being heard and that they matter a great deal, somehow helps. And remember you are embraced by many, including me. Hugs.